This year (2016) marks the 100th birthday of the famous author Roald Dahl – much loved for his children’s books such as Matilda, Charlie and the Chocolate Factory, and The BFG. 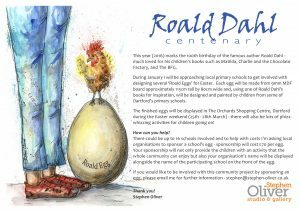 During January I will be approaching local primary schools to get involved with designing several ‘Roald Eggs’ for Easter. 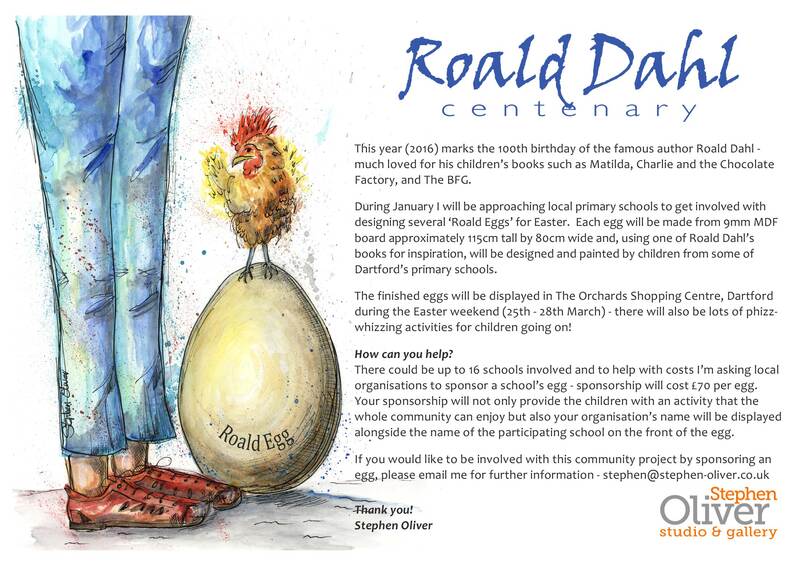 Each egg will be made from 9mm MDF board approximately 115cm tall by 80cm wide and, using one of Roald Dahl’s books for inspiration, will be designed and painted by children from some of Dartford’s primary schools. The finished eggs will be displayed in The Orchards Shopping Centre, Dartford during the Easter weekend (25th – 28th March) – there will also be lots of phizz-whizzing activities for children going on! There could be up to 16 schools involved and to help with costs I’m asking local organisations to sponsor a school’s egg – sponsorship will cost £70 per egg. Your sponsorship will not only provide the children with an activity that the whole community can enjoy but also your organisation’s name will be displayed alongside the name of the participating school on the front of the egg. If you would like to be involved with this community project by sponsoring an egg please email me for further information.